Master 1 - Tape 2 Somewhat random sequence of shots: Minefields exploding. Men in gas masks and in helmets, kneel by machine gun on tripod. Portable warfare, as they move it up to the front. Soldiers stand in trenches. Cannon fire shot and landed. People walking through towns. Soldiers firing from foxholes. 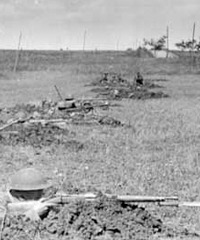 Line of rifles from behind ditch. Bayonets. Large bombs exploding. Biplanes in the sky. Cannons pulsating, firing. Come CUs. Military truck with tarp over back drives through muddy roads, flanked by soldiers. Ground to air fighing--CU machine gunner as he shoots at the sky. Direct hit on dirigible/blimp/barrage balloon: Bursts into flames and falls. Lots of burning towns. Bombed-out villages. Group of soldiers with gas masks marches in a trench, holding their rifles over their shoulders. Bombs bursting in air, more firing from trenches. Soldiers run down railroad tracks. Group of soldiers run on a battlefield, smoke all around. Master 1487 - Tape 1 High angle LS French Army soldiers crouched in bomb crater on battlefield during World War I (WWI), explosion, smoke in BG. Quick LS large artillery explosion on battlefield. Panning high angle LS French Army soldiers charging onto battlefield from bomb crater. 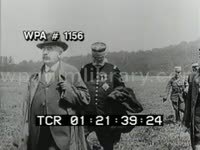 (93-11) Excellent TLSs crowds of happy, elated, jubilant urban citizens (predominantly male, exclusively white) of London, England, cheering, waving hats and hands and small American flags; newspapers bearing news of German surrender. Great tilt down LS confetti, ticker tape drifting from tall building, people leaning from windows, large American flag billowing from facade. Panning high angle LS crowds celebrating in streets, confetti drifting from buildings, traffic (including Victorian-era horse carriage coach cab) struggling to pass through congested streets; note the American flag hanging from bldg in BG; folks wave hats, hands, flags. Master 1807 - Tape 2 GV military band marching down street. MS soldiers marching down street in parade. 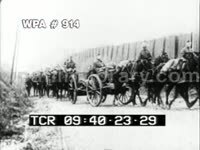 GVs WWI soldiers working on railroad. GV soldiers walking horses. MS pan of soldiers digging and chopping in forest. POV looking into mouth of cannon as it fires. GVs cannons shooting and explosions. 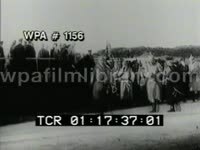 MS armed African American soldier standing guard in front of hut, troops rush to hut and grab guns that are lined up outside. MS armed U.S. troops running out of hut. LS armed troops running over field, an explosion happens in the foreground. Brief GV of tank shooting. MS explosion with smoke. MS armed troops running over hill. MS soldiers loading gun. GV tank firing. MS explosion. GV armed troops running over field. MS tank firing. MSs explosions. GV armed troops standing up from trench and running over field. MS tank firing. MS explosion. GV troops advancing over field which is shrouded in smoke. GV military ceremony with troops in inspection lineup, one soldier holds an American flag. MS of three African American soldiers having medals pinned to their uniforms. High angle LS of military parade. MS of African American women in parade crowd smiling and waving American flags. GV soldiers marching in military parade. WW I battle: explosions, ground advances, trenches, doughboys, etc. WWI Artillery barrage and battle / trenchwarefare montage. Troops marching through war damaged cities. CU of Foch. Pershing addresses the troops. Troops preparing to move, marching. Battle scenes. Recreations of battle for San Miguel passageway (seems to be a Hollywood recreation). WWI Scenes WWI battle ship, firing. CU of guns on ship. Various shots of ships. Torpedo firing. Ship on fire. Survivors in a lifeboat. Ship sinking. CU of newspaper headline. Guns firing. Survivors in a lifeboat. Ship sinking. WWI (World War One) battle montage: TLS explosion on battlefield; MS soldier tossing grenade; TLS tank rolling over trench. TLSs soldiers running from trench, advancing over hill & into enemy trench. Officers study field. WWI (World War One) TLSs soldiers running from trench, advancing over hill & into enemy trench. Tanks roll. Western Front, Battle/Combat: Excellent TLS/MSs hard-working British & Australian Army artillery units loading & firing field artillery, intercut with nice shots of ground explosions. Western Front, Trench Warfare, Winter Battle/Combat: LS camouflaged field cannon firing. MS British soldiers loading, firing mortar from trench. MS British soldier exiting trench bunker, putting on gas masks. MS Tommies walking through zigzag trench while wearing gas masks. TLS field artillery firing from concealed position. Great TLS ground explosion; TLS Tommies walking through trench, some throwing snowballs at each other. MS Brit soldiers rushing along trench with rifles, closing gate. TLS field guns firing. Nice side view TLS waves of Tommies coming out of trenches, advancing. GVs heavy artillery firing & ground explosions. WWI Aviation, World War One, Dogfight: TLS pan field with fighter planes. LS/GV aerial combat with opposing sides battling, diving & swooping, looking like birds of prey soaring through the air. Great POV from cockpit as smoking biplane in field-of-vision spirals in a downward motion, plane has been hit. LS plane smoking & spiraling. POV from cockpit, following the smoking plane, hit in battle. 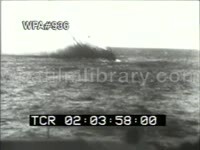 LS/GV following the damaged plane, smoking as it spirals out of sky. Brief GV as airplane crashes into ground. WWI Combat MS/MCUs soldiers in the field firing cannons. LS explosion in field. GV soldiers (Doughboys) climbing out of trench to charge enemy (trench warfare). Low angle LS looking up at a fleet of airplanes flying overhead. WWI. AEF artillery outfit marching along a rural road. Artillery firing during night battle (nice sky bursts, battle by flare light). 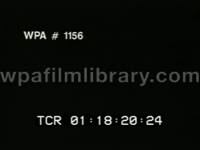 Narration is not availble for licensing.